A few months ago I had a wicked cold and I was wanting to use edibles to medicate. Smoking while you have a cold is maybe not the best idea. Seriously, the idea of it borders on idiotic. If you want to medicate with Cannabis I shared my experience and how cannabis can actually play a role in cold care Here if your interested. Getting back to my point….If you have a cold you don’t exactly want to be eating refined sugar. Smoking and sugar = no good for cold recovery. Remember the above question and it’s answers…..well all those edibles are damn delicious but they aren’t exactly appropriate for anyone who is avoiding refined sugar. I mean duh!!!!!! If you follow this blog or even if you have only met me once and have spent five minuets talking to me it is pretty much a no brainer that that is something I should be doing. The lightbulb went off and so the experimenting began. Today I give to you my first, in what I hope will become a long list of many, healthy edible recipe. Position oven racks in the upper and lower third of oven. Preheat oven to 150 ℉. Line Excalibur trays or your baking sheets with parchment paper. Set aside. Core apples (optional). I don’t bother coring pears as I find it easy enough to just cut around the core. Slice apples and pears to about 1/4 inch thickness. I leave the skin on. Whisk together melted oil and vanilla extract. For accurate dosing measure out 1/4 tsp of cannabliss butter and vanilla blend and brush onto the front and back of each slice. Each slice is getting 1/4 tsp of cannabliss butter. Place apples on the baking sheet in a single layer and not touching each other. Sprinkle cinnamon sugar evenly over apple slices. Bake for approximately 4 hours and then turn each slice over, and continue to bake for another 4 hours or so. The longer they stay, they crispier they get. Depending own your oven this can be anywhere between 8-12 hours. Set the temperature dial to the highest setting available – 155 degrees. I like to rotate the trays every couple of hours to help dry out the chips evenly. The trays of apples need anywhere between 8-12 hrs. If you want a chewier slice then you may want to go with less time. 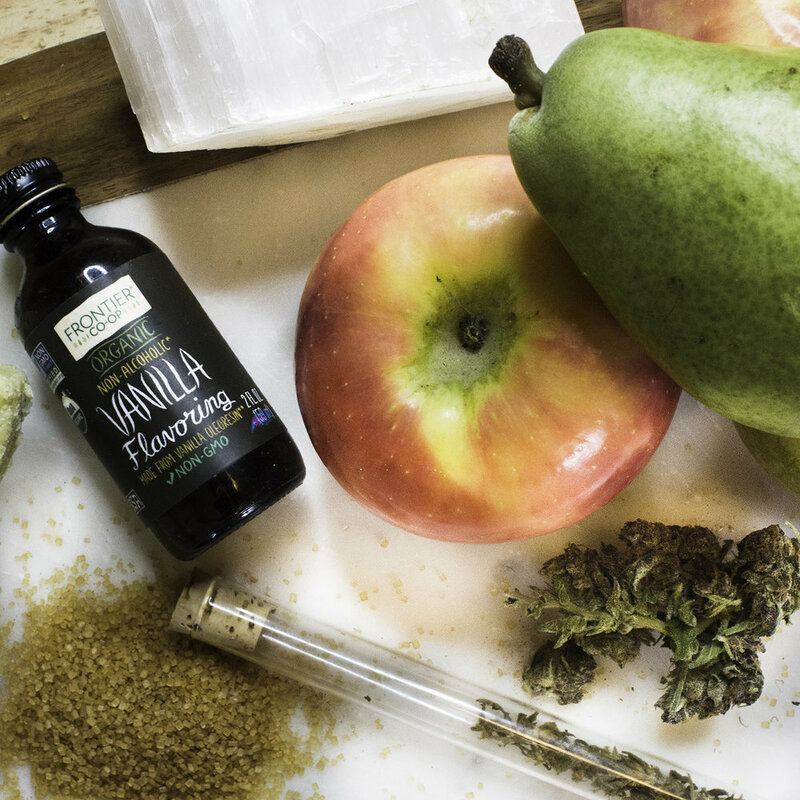 If you have extra Cannabliss butter lingering in your bowl check out the DIY VIdeo for how you can use this yumminess up. Because why the hell would you want to waste that?!?!? The baking time will vary based on the thickness of each slice and the moisture content of the variety of the apples. If you want to make a stronger batch you can use up to a half cup of Cannabliss Butter. Don’t go above a half cup as you the fruit slices will only absorb so much of the Cannabliss Butter. If you add to much oil in the effort to make these stronger you will end up a) waisting oil and/or b) chips will never get crispy. If you want a stronger end product I recommend making your Cannabliss Butter stronger so that you can keep the proportion of 1/4 tsp of per slice. That being said when it comes to Cannabis stringer does not necessarily mean better. I’m going to be writing a whole post about microdosing, but for now I’ll give you this little snidbit from and a great article over at Green Flower……. To sum that up for you…..some people will experience an effect from using cannabis at a low dose and then they will lose that effect as they take more, only to reach another response at an even higher dose. In taking too high of a dose you could actually be diminishing the healing effects of the flower. In the case of someone with bad anxiety, if they dose too high they end up paranoid and a full on panic attack. I think most of us have either experienced this or witnessed this. However, if that same person uses a microdose they can actually receive a very calming and therapeutic side effects from the flower. I could turn this into a long one but for my own Self Care Sunday purposes I need to get a move on with my day. I am a Philly girl after all and the big game is on tonight soooo I need to get some stuff done so I can chill and enjoy the game later. Oh, One last thing!!!! Please, please, please share with us what kind of 420 recipes would you babes like to see more of?!?!? Disclaimer: All Recipes created for this blog are made within a 420 friendly state. Though we may not agree with the laws placed against Marijuana throughout this country, we are in no way advocating or suggesting that you break the laws within your own state. If you disagree with said laws I highly urge you to fight against the laws restricting marijuana within your state. That being said all recipes on this site are only intended for use by those who live in states or countries where medical and or recreational use of marijuana is legal, for those who are of 21 years of age and of sound mind. Remember to never operate heavy machinery or drive a car under the influence of cannabis.